Abstract: This paper reexamines quantitative indicators of national economic and military power since 1820 and discusses their meanings for the trajectory of power concentration in the contemporary world-system. We discuss the causes of U.S. hegemonic decline and consider what the consequences are likely to be for global governance in the future. Using the evolutionary world-systems approach to understanding cycles of centralization and decentralization in interpolity systems, we consider the similarities and differences between the hegemonic declines of the United States of America and the United Kingdom of Great Britain. We also discuss the possibility of another round of U.S. hegemony and how revitalization of U.S. manufacturing could allow the U.S. to once again play a more central role in world politics. We discuss how this could happen and the factors that are likely to prevent it from happening. We also discuss the likelihood of a period of hegemonic rivalry, conflict, ecological disasters and chaos in the next few decades and the possibility that a collectively rational and democratic global commonwealth might emerge. All hierarchical human systems exhibit a sequence of concentration and deconcentration of power, but the nature of power and the causes of rise and fall evolve as world-systems get larger and more complex. The modern world-system has experienced a series of episodes of global governance organized around the predominance of a hegemonic national state that has enjoyed a temporary superiority in economic centrality and political/military power and influence: the United Provinces of the Netherlands in the 17th century, the United Kingdom of Great Britain in the 19th century and the United States of America in the 20th century. All three were former semiperipheral polities that rose to core status and then took up the role of political and economic hegemony. This sequence, along with the institutionalization and spread of the international system of sovereign states and the rise of supranational political institutions since the Napoleonic Wars, constitutes the evolution of global governance as it has occurred in the modern system. 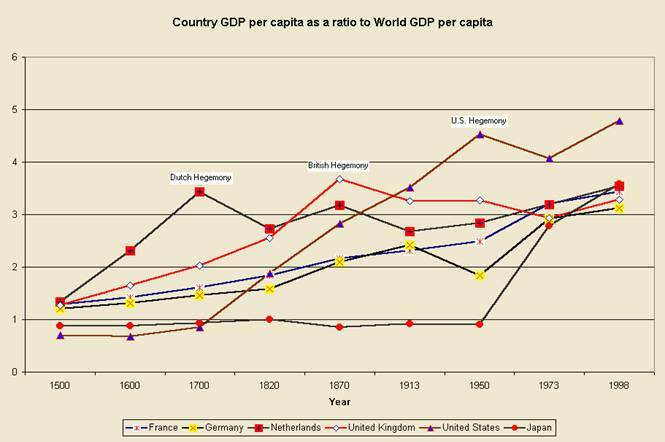 Figure 1 uses ratios of national Gross Domestic Product(GDP) per capita to the average world GDP per capita to illustrate the three hegemonies and to show the relative trajectories of France, Germany and Japan since 1500 CE. We are now once again in a period of deconcentration, an inter-regnum in which a hegemon is declining. 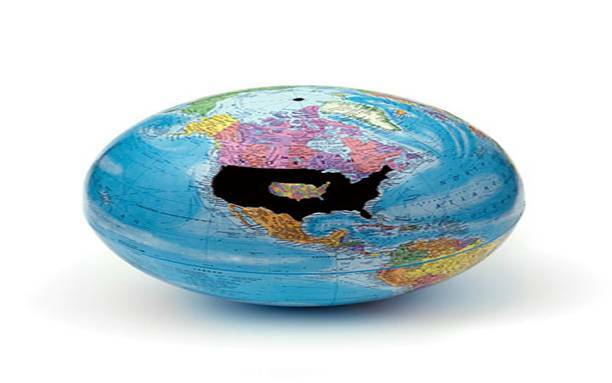 Hegemons perform functions of global governance, especially by maintaining a level of stability within which the global economy can operate relatively smoothly. Periods in which there is no hegemon tend to be more contentious and violent, as contenders for global leadership struggle with one another over who will be the next hegemon. We contend that the period in which we are now heading is unlikely to eventuate in the rise of another hegemon that could replace the United States. Rather we suppose that a multipolar world will eventually move in the direction of global state formation in which an alliance of powers cooperate to perform the functions of global governance formerly performed by the hegemon. These developments allow the hegemon to experience a late “belle époque” or an “Indian summer” during which its decline in economic hegemony stabilizes. There may also be some new technological innovations in this period, but the main tool for making profits shifts toward the expansion of credit and financial services. Another similarity between the two periods of hegemonic decline is what has been termed “imperial overreach.” Some of the leaders of the declining hegemon come to fear that financialization is a bubble that cannot continue to expand, and so they choose to play the other card in the hegemon’s hand --preponderant military superiority (Kennedy 1980; Modelski 2005). The story of the neoconservative plan to restore global order by using U.S. military superpower to control the global supply of oil has been told and retold (e.g. Stokes and Raphael 2010). The British tried a similar gambit at the end of the 19th century led by an elite group of Round Table journalists and futurists (Quigley 1981). The Boer Wars were part of a plan to control the African continent and to create a world government of English-speaking peoples. But the Boers, like the Vietnamese and the Taliban, refused to go along with the program. Another similarity: the language of the declining hegemon is English. This has had a huge consequence for global linguistic standardization. Great efforts to promote a synthetic global language, Esperanto, in order to facilitate global communication and cooperation, failed. But English has become the de facto language of global business despite that it is resisted and resented by many national cultures and that cosmopolitans and multiculturalists try to support multilingual interaction and communication. This has largely been the product of two centuries of hegemony by English-speaking powers and successive waves of global economic integration. But there are also important differences between the two periods of hegemonic decline. The British went into decline during a period in which the world-system was still greatly structured by colonial empires, including the huge British Empire which was larger than any earlier polity on Earth. British imperial control over India was a huge advantage that enabled the British state to control large financial resources and to deploy colonial troops on a global scale. By the time of the U.S. decline the formal colonial empires had been abolished. Indeed the U.S. itself was formed from a rebellious group of former colonies at the beginning of the first wave of decolonization. And the U.S. had supported Latin American decolonization in the 19th century and helped to dismantle the French, English and Dutch colonial empires after World War II. The legitimation of U.S. hegemony was constructed around the idea of the right of nations to self-determination. And in exchange for supporting decolonization the U.S. was able to establish a global system of military control with 737 military bases around the world, most of which were located by treaty in the former colonies of other European core states ( Johnson 2006; Go 2007). Thus did the world of colonial empires evolve into a system in which the hegemon became the de facto world state in control of a global military apparatus. But the U.S. federal government must rely mainly on taxes it receives from its own citizens. It does not have a colonial empire to tax. And the U.S. military is not able to command soldiers from a vast colonial empire of subjects. It must find residents of the U.S. to perform military services. While the U.S. internal regime is somewhat similar to that of Great Britain, it is also different. The biggest differences have to do with size and access to internal resources. Whereas the British Isles are small, the United States came to be a continental-sized power with substantial internal natural resources. Britain became the workshop of a world in which it needed to import a lot of raw materials, whereas the U.S. has internal raw materials that compete with the products of other lands (Bonini 2009). · A labor movement that has been militant at times, but in which the radical elements were more thoroughly defeated and politically marginalized. The U.S. a purer form of the liberal capitalist democracy than its mother country was or is. There are also both important similarities and important differences between the 19th and 20th century waves of globalization that need to be taken into account in order to understand the contemporary world historical situation. Both were periods of increasing integration based on long-distance trade, increasing foreign investment and the expansion and cheapening of global transportation and communications. In both periods markets were deregulated and disembedded from political and socio-cultural controls (Polanyi 1944). In both waves of globalization a hegemonic core power rose to centrality in the global political economy and then declined, losing first its comparative advantages in the production of consumer goods and then capital goods. Both declining hegemons then used their centrality in global networks to make money on financial services. Indeed, much of the whole world economy became financially organized around the hegemon, whose currency served as world money. The size of the symbolic economy of “securities” – financial instruments representing ostensible future income streams—grew far larger than the economy that was based on transactions of material goods and services. In both waves of globalization capitalist industrialization spread to new areas and came to involve a far larger number of the world’s people in global networks of production and exchange. There were also important structural differences between the two waves of globalization. Again, formal colonialism was abolished from the global polity during the most recent great wave of globalization. The interstate system of legally sovereign states was extended to the non-core, and so core states could no longer extract tax revenues from their colonial empires. In the late 19th century and early 20th century the British were able to use their empire, especially its direct control over India, to finance the operations of the British state. And Britain also was able to mobilize large numbers of soldiers from its colonies to fight in the Boer Wars and in World War I. Both colonial revenue and cannon fodder were available to the hegemon as well as to some of the other contending core powers. That is a source of support that no longer exists because of the evolution of global governance. When the U.S., like Britain, began to use its centrality in global military power to try to shore up its declining hegemony, it had to rely primarily on U.S. citizens to perform soldierly duties. And it could not, as did the British, directly tax a colonial empire to financially support its adventures. Probably the most important structural difference between the 19th and 20th century waves of globalization is the far greater relative size of the hegemon. Figure 2 shows the proportions that the U.S. and British home markets constituted in the total world Gross Domestic Product. At its peak in about 1900 Britain’s share was less than 10%. At its peak in 1945 the U.S. share was 35% and, though it has declined in a series of steps down since then, it was still 19% in 2007. This is nearly twice as large as the British economy was at its peak. Thus the relative size of the hegemon in the larger world economy has more than doubled. This simple fact has allowed the U.S. to play the financialization card much more effectively than the British were able to do. Figure 2 graphs the shares of global GDP of selected countries: the United States, the United Kingdom, China, India, Russia/USSR and the 12 European countries that were the original members of the European Union (Austria, Belgium, Denmark, Finland, France, Germany, Italy, Netherlands, Sweden, UK, Portugal, Spain) added together to show what has happened with the European Union’s trajectory in the global economy. GDP is a measure of economic size that is strongly influenced by territorial and population size as well as by level of economic development. Figure 2 shows the U.S. trajectory that is the main focus of this paper. As reported in Chase-Dunn, Reifer, Jorgenson and Lio (2005) the U.S. share of the global economy peaked in 1945 when the rest of the developed world was in a shambles as result of the destruction caused by World War II. Since then the U.S. share has declined, but the downward slope has been interrupted by two periods in which the U.S. share stabilized for a few years. These periods were from 1958 to 1968 and from 1985 to 1997. And there were brief reversals of the downtrend from 1947 to 1951 and from 1997 to 1999. Since 2000 the U.S. share has steadily declined. Figure 3 is a similar graph that shows the same countries and time period as Figure 2 except that it displays the GDP per capita of each country as a ratio to the world average GDP per capita. This is more purely a measure of relative economic development rather than economic size. The GDP per capita ratios for the European Union (EU) shown in Figure 3 were computed by summing the population of all EU members and dividing the EU GDP by this summed total population to get the average GDP per capita for all EU nations. Then we took this average GDPPC and divided it by the average world GDP per capita to get the GDP per capita ratios. There are important differences between Figures 2 and 3 as well as some similarities. The U.S. trajectory is similar in the two graphs until about 1980. After that the relative level of economic development shown in Figure 3 rose again during the neoliberal financialization period from 1980 to 2000, whereas in purely size terms shown in Figure 2 the U.S. trajectory was flat during this period. In both graphs the U.S. declined sharply after 2000. The trajectory of the EU is also quite different in the two graphs. In terms of economic size (Figure 2) the EU declined after 1970, while in terms of relative level of development (Figure 3) the EU went up from 1950 to 1980 and then flattened out and then declined. Japan’s rise was much more dramatic in terms of relative develop than it was in terms of size. And huge differences are shown in the relationships that China and India display with the other core powers. In terms of economic size (and using the PPP exchange rates provided by Maddison) China seems to have converged with the U.S. by 2007 shown in Figure 2. But in Figure 3 (relative levels of development) China and India were still far below the U.S and the other core powers. The British were capital investors in the rest of the world, and returning profits on foreign investments were an important factor sustaining the “belle époque” of the Edwardian era before World War I. The U.S. has obtained great returns on investment abroad, but it has also been sustained by huge flows of investment from abroad into the U.S. This is a big difference between British and U.S. hegemonic decline. The British mainly exported capital and got returns from investments abroad. The U.S. has done that too. The investments abroad of U.S. multinational corporations grew rapidly in the decades after World War II. U.S. companies established subsidiaries in many countries, branch offices and manufacturing operations as well as resource-extracting firms (mines, logging companies, fruit companies, etc). This is called “direct” investment because the headquarters firm owns and controls the subsidiary. Other core countries and some non-core countries also greatly expanded the operations of their own multinational corporations. The core countries also expanded their purchases of bonds from foreign national and local governments, and eventually core capital flowed in to newly emerging stock markets in noncore countries. This is called “portfolio” investment because the owner does not have control over the day-to-day operations of the entities whose securities are purchased. All this was similar to the export of capital by the British and other core countries in the great wave of 19th century globalization. But then something different emerged -- huge inflows of foreign investment into the United States, first from other core countries, especially Japan and Britain, but later from non-core countries as well, especially China. It is these flows, which have taken the form of buying bonds as well as investment in real estate and stocks, which sustained the long U.S. expansion during the 1990s and the first years of the 21st century. Michael Mann (2006) has called this “dollar seignorage.” U.S. federal government spending has been made possible without increasing taxes because governments and investors abroad have been willing to buy U.S. government bonds. This massive influx of money has also allowed the U.S. to sustain a huge trade deficit in which imports of foreign goods and services have come to vastly exceed the amount of U.S. goods that are exported, despite the outsourcing of jobs by U.S. companies (see Figure 4). Because of its ability to sell bonds the U.S. government was able to keep interest rates low and so developers built new housing, and homeowners were able to sell their old houses and move into larger houses because the prices of housing tended to go up. Residential mortgages were also subsidized as they had been since the G.I Bill of Rights after World War II, but the mortgage industry kept expanding credit and lowering the requirements for obtaining a housing loan. Mortgages from the residential and commercial real estate markets were also repackaged by Wall Street financial entrepreneurs as global commodities and sold to institutional investors all over the world. Thus did the wave of financialization during the U.S. hegemonic decline take on new dimensions that differentiate it from what happened at the end of the 19th century. The U.S. government was also able to finance overseas wars in Afghanistan and Iraq by selling bonds to foreign investors, including the Chinese, who came to have such a stake in the U.S.-led financial bubble that they have become important supporters rather than challengers. The U.S. is also far more supreme in military terms than Britain ever was. The United States currently maintains 737 military bases abroad. By comparison, at the peak of its global power in 1898 Britain had 36 bases (Johnson 2006: 138-39). Modelski and Thompson (1988; 1996) contend that global reach, as indicated by naval power, is the best measure of concentration and deconcentration of power in the global system. Their careful study of the evolution of warships has been used to construct a measure of the rise and fall of global military power. Figure 5 shows the relative seapower of Britain, the U.S., France, Russia and Germany since 1820. Modelski and Thompson (1988:11-13) estimate naval power by obtaining information on the number of warships in the possession of each great power and then dividing this figure by the total number of warships in the possession of all world naval powers. This index for each nation represents the national share of the world’s warships. Modelski and Thompson (1988:44) only include “global powers” in their calculation of the seapower index, which they define as nations that either (1) possess at least 10% of all warships in the world or (2) account for at least 5% of total world naval expenditures. Utilizing these criteria, while multiple nation-states are considered global powers for years prior to World War II, only the US and Russia qualify as world powers after World War II. Figure 5 shows the declining relative seapower of Great Britain, the amazingly low relative seapower of Germany, the main challenger for hegemony in World Wars I and II, and the relationship between the U.S. and the Soviet Union during the Cold War. The overwhelming superiority of the U.S. has gotten even greater since the fall of the Soviet Union in 1989. Another measure of relative military power is that developed by the Correlates of War Project (Singer 1987). The Correlates of War (COW) Project estimates the power of nation-states by selecting key indicators that reflect the breadth and depth of the resources a nation could utilize in militarized disputes. This is referred to as national material capabilities (NMC). NMC is measured by utilizing national estimates of demographic, industrial, and military capacity to create on overall measure of NMC, these variables are: total population, urban population, primary energy consumption, iron and steel production, military personnel and military expenditures. Figure 6 graphs the COW NMC values for the U.S., Great Britain, the European Union, China and India. There are some very big differences from the seapower graph presented in Figure 5. The COW measure takes into account the size of the military as indicated by the number of soldiers. The Chinese military is very large because the Chinese population is very large. Demographic size has always been an important component of war capability. The Modelski and Thompson emphasis on seapower and global reach distinguishes between regional power systems in which forces confront their adjacent neighbors (usually with armed ground forces), and global power, in which the ability to coordinate force on an intercontinental scale using naval power is important (see also Rasler and Thompson 1984). They see an important interaction between global and regional military geopolitics that can only be observed and analyzed by distinguishing between naval global reach and regional army power. The results shown in the Correlates of War NMC graph (Figure 6) conflate the global reach (naval) and regional (army) power estimates. Figure 6 implies that China surpassed the U.S. in terms of relative military capability in 1995. This only makes sense by making the kind of global/regional distinction proposed by Modelski and Thompson. We concur with Modelski, Thompson and Rasler that there is an important distinction between military global reach and the ability to exercise military power vis a vis adjacent states. But for us this is conflated with the link between global capitalism and global military power. The kind of global capitalism represented by the U.S. and British hegemonies has been liberal and neoliberal capitalism in which capitalist merchants, industrialists and financiers have unusually predominant sway over the policies of their national states. But the U.S. is also unusual in the extent to which it is both a continental-sized state with important internal natural resources and a state that is under the control of global capitalists. We also agree, at least partially, with some of the theorists of a new stage of global capitalism who are focusing attention on the notion of global class relations and the emergence of a transnational state. The trajectory of the U.S discussed here is part of the long process of the transnationalization of class relations and a process of political globalization in which international political organizations have become more and more important for global governance. The strongest economic challenges to U.S. hegemony in manufacturing during the decades after World War II came from Germany and Japan, the countries that lost the war. During the long Cold War between the U.S. and the Soviet Union, the other core countries were content to let the U.S. be the superpower in military terms and so they did not develop their own military capabilities to any significant extent. After World War II both Germany and Japan renounced the use of military power, and kept only small capabilities, relying on the U.S. for protection. The consequence, after the demise of the Soviet Union, is that serious global military power is a near monopoly of the hegemon. This is a very stable military structure compared with what existed in the world-system before World War I. No single country, and not even a coalition of countries, could militarily challenge the United States. But this structure had been legitimized by the Cold War and by a relatively multilateral approach to policy decisions employed by the United States in which major decisions were taken in consultation with the other core powers. International relations theorists have argued that conflict within the core is quite unlikely because all the major core powers have democratic regimes. The “democratic peace” idea is that sharing a set of political values makes conflict less likely, and that democratic regimes should be less likely than non-democratic ones to initiate warfare. The relevance of this hypothesis for the future of the probability of war among powerful states is based on the assumption that the great powers remain democratic. This seems plausible enough if we could assume stable economic development, well-legitimized institutions of global governance and fair access to a growing supply of natural resources. Environmental crises, population pressure, financial crises and hegemonic decline might well provide challenges that the “democratic peace” factor is not strong enough to mitigate (Chase-Dunn and Podobnik 1995). A similar argument applies in the case of those who contend that a global stage of capitalism has emerged ,or is emerging, in which there is a single integrated transnational capitalist class (Sklair 2001) and an emerging transnational state (Robinson 2004, 2008). Globalization has indeed increased the degree of global coordination and integration, but will the institutions that have emerged be strong enough to prevent the return of conflict among the great powers during a new period of deglobalization, hegemonic decline, peak oil, resource wars and strong challenges from social movements and counter-hegemonic regimes in the non-core? That is the question. The United States has been in decline in terms of hegemony in economic production since at least the 1970s and, as we have seen above, this has been similar in many respects to the decline of British hegemony in the late 19th century. The great post-World War II wave of globalization and financialization is faltering, and some analysts predict another descent into deglobalization. The declining economic and political hegemony of the U.S. poses huge challenges for global governance. Newly emergent national economies such as India and China need to be fitted in to the global structure of power. The unilateral use of military force by the declining hegemon has further delegitimated the institutions of global governance and has provoked resistance and challenges. A similar bout of “imperial over-reach” in the late 19th and early 20th centuries on the part of Britain led to a period of hegemonic rivalry and world war. Such an outcome is less likely now, but not impossible. After the attacks of September 11, 2001 the United States adopted a more unilateral approach in which actions were taken despite the opposition of some of its most powerful allies. Germany and the U.N. Security Council did not support the invasion of Iraq in 2003. This unilateral approach was reminiscent of Britain’s “imperial over-reach” at the turn of the 20th century, but the context is importantly different. In both cases uneven economic development has led to the emergence of new challenges to the economic pre-eminence of the hegemon, but during the U.S. hegemonic decline there are no serious military challengers among the contending states. Armed resistance is mainly confined to those who employ “weapons of the weak” (e.g. suicide bombers) and a few low-intensity guerrilla forces in non-core countries. The U.S. has been encouraging Germany and Japan to expand their military capabilities in order to take up some of the expensive burden of policing the world. The U.S. share of total global military power is so great that it is hard to imagine a situation any time soon in which the structure of military power among core states would become similar to the more even balance of miltary capabilities that existed before World War I. The U.S. would have to greatly reduce its military capability, and potential challengers would have to dramatically increase theirs. Since military capability is highly dependent on economic wealth, the decline of U.S. economic hegemony could eventually have such a result, a point that was made by Barack Obama during the presidential campaign of 2008. But it takes time to build up military capability. This could happen quickly if an arms race situation were to emerge such as the one that existed before World War I between Germany and Britain. But in the current situation who would play the role that Germany played before World War I -- an economic challenger that morphs into a military challenger? No single country could do this because the U.S. supremacy is so great. But a coalition of countries (Japan and China, China and Russia, Germany and Russia, or the European Union) could conceivably do it at some point in the future. Another Round of U. S. Hegemony? Modelski and Thompson (1994) contended that there were two rounds of British hegemony; one in the 18th century and another one in 19th century. They contend that under some circumstances a hegemon can succeed itself. The logic of sclerosis can be overcome if new internal interest groups who are partisans of new industries can overcome the power of the vested interests of the old industries. Normally this is not possible within the confines of a single national polity and this explains why hegemony usually moves on. Indeed uneven develop has been the main rule for centuries. If this were not so an initial comparative advantage would last for millennia. Mesopotamia, the original heartland of cities and states in the Bronze Age, would still be the leading edge of human sociocultural evolution. Long term studies of the largest of cities and empires show that hegemonic empires rarely succeed themselves, although this has happened occasionally (Wilkinson 1991). The most explicit argument for the likelihood of another round of U.S. hegemony was made by Joachim Rennstich (2001, 2004). Rennstich noted that the decline of earlier great powers had much to do with institutional rigidities. The British had a hard time moving from the family-centered firm to the corporate structure pioneered in the U.S. But the U.S. is a more flexible society with a history of political efforts to restrain monopolies. The rise of the NASDAQ stock exchange despite resistance from the New York Stock Exchange is an important example of U.S. institutional flexibility. Rennstich contended that the U.S. has developed a powerful capability by which newly rising industries could escape the clutches of old vested interests and flourish. He noted that high technology firms that felt that they were being sidelined at the New York Stock Exchange were able to form their own stock market, the NASDAQ. This was possible because the culture of the U.S. genuinely supports innovation and independence, and because an anti-monopoly tradition in the U.S. federal government occasionally gets trotted out by political entrepreneurs who go after firms that appear to be too greedy at the expense of the consuming public. Rennstich also noted that U.S. culture is somewhat unusually open to social and economic change relative to other national cultures. Europeans worry about genetically modified foods (GMOs), whereas consumers in the U.S. do not seem to mind that ‘frankenfoods” can be sold to them without labeling. Rennstich’s point is that this is a very flexible culture that is open to change, and that this characteristic is probably an advantage in future competition over new lead industries (especially biotechnology). Of course there are other interpretations of the GMO issue. Large corporations have great influence over the activities of government regulators in the U.S. and spend large amounts of money to influence public opinion. These factors might work for or against a new round of hegemony based on reindustrialization depending on the balance of forces within the U.S. corporate elite. Arguably the powers that be on Wall Street do not need another round of U.S. hegemony based on new lead industries because they are making plenty of profits by investing outside of the U.S.. This is similar to what happened with the expansion of foreign investment by the British capitalist class. It is well-known that the U.S. has had a comparative advantage in higher education, especially in research universities that develop advances in both pure and applied sciences. This advantage should lead to an advantage in the commercialization of new technological advances and, in principal, could be the basis of a restoration of U.S. economic hegemony that is profitable enough to continue to support those aspects of hegemony that are less profitable. Information technology has probably already run the course of the product cycle from technological rents to competition over production costs. There will undoubtedly be a few new gadgets and profitable Internet services that will redound to U.S. firms such as Apple and Google, but this is not likely to be the basis of a new growth industry in which returns are concentrated within the U.S. We have already mentioned that British hegemonic decline occurred despite that Britain continued to lead in some new high technologies such radio, radar and television. Britain also maintained its centrality in the global telegraph network during World War I, enabling it to read communications between the Germans and other countries that were intended to be secret (Hugill 1999). But a few cutting edge innovations are not enough for the restoration of economic hegemony. Biotechnology and nanotechnology have greater possibilities. And green technology that allows more efficient use of natural resources is also a possibility. A restoration of U.S. economic hegemony could also provide the resources for a potential restoration of U.S. political hegemony. Of course the new regime would have to distance itself from the kind of unilateral adventurism displayed in the second Iraq war, and would have to respect the existing institutions of multilateral global governance that the U.S. championed after World War II. Greater concern about global equality and a genuine effort to understand peoples who are culturally different might go a long way toward undoing the damage done by the neoconservatives during the Bush administration from 2000 to 2008. One advantage of such a development that might find support both at home and abroad is that the current unipolar structure of the global military apparatus could be maintained, thus reducing the probability that another round of hegemonic rivalry might descend into world war, as it always has in the past. Such a unipolar structure of military power could be made much more legitimate by bringing it under the auspices of the United Nations or an expanded and democratized North Atlantic Treaty Organization. If this were combined with disarmament of national forces, the overall size and expense of the global military apparatus could be reduced. Rennstich made his argument about the possibility of another round of U.S. hegemony ten years ago. The characteristics he pointed out may have partly accounted for the recovery of the U.S. in the 1990s, though these characteristics will probably not be strong enough to overcome the path dependencies that stand in the way of a geneuine resportation of U.S. hegemony based on comparative advantage in production. The Obama campaign in 2006 promised a new political regime with a strong industrial policy of renewal that was willing to husband resources and invest in education and product development, and that could overcome the internal resistance to new taxes by mobilizing a popular constituency to support these developmental projects. The election of Obama reminded world-systems evolutionists that world history is open ended. The demise of these policy proposals also reminds us that unexpected conjunctural events tend to get ironed out by the structural forces of the longue duree. The most recent financial meltdown that began in 2006 is similar in many ways with earlier debt cycles, but different in others (Chase-Dunn and Kwon 2010). Despite greater reliance on less centrally-coordinated market-based approaches to debt problems (Suter 2009), there has not been a total collapse of the global financial system. The Wall Street bail-out allowed the stock markets to recover. There appears to be a very slow recovery of investment but a continuing high level of unemployment. This said, the global economy has not really collapsed. There have been a few protectionist challenges to the “free trade” regime, but trade globalization was still going up as recently as 2006. Investment globalization has become wobbly, but it has not yet collapsed. The recent meltdown has not as yet led to something like the Great Depression that began in 1929. Within the United States there has not been a rebirth of strong anti-capitalist social movements. Rather the populist right has made the most hay out of anti-Wall Street sentiment. A “New Deal” situation has not emerged. Rather the right has gained support by accusing the black President of being a socialist and a Muslim, while those on the Left him as a Hoover rather than a Roosevelt. All this portends a continuing slow decline of U.S. hegemony rather than any abrupt change or another round of hegemony by the U.S. This is not surprising from the point of view of recurrent cycles of hegemonic rise and fall. A more likely scenario for the next several decades is continued U.S. hegemonic decline and resultant economic and political/military restructuring of the world-system. Here the scenario bears a strong likeness to what happened during the decline of British hegemony at the end of the 19th century, but with a few important differences. We have already seen some developments that are strongly reminiscent of the British hegemonic decline. The neoliberal “globalization project” was mainly a crisis-management response to a profit squeeze in manufacturing when Japan and Germany caught up with the U.S. after recovering from World War II. The rise of the neoconservatives and unilateral “imperial over-reach” was again crisis management in response to the obviously untenable position of the U.S. balance of trade that emerged after 1990. These and the rise of new economic competitors such as China and India are strong similarities to the earlier period of hegemonic decline. We have also mentioned the expansion of finance capital that was an important characteristic of the last phase of both British hegemony and of U.S. hegemony. There is another important difference between the periods of British and U.S.; hegemonic decline that we have not yet mentioned. British decline and the inter-regnum between the British and U.S. hegemonies occurred during a period of transition from the coal to the oil energy regime in which the cost of energy was falling (Podobnik 2006). This time around hegemony is declining during a period of generally rising costs of non-renewable resources. This energy cost difference probably slants the system toward chaos. It is well-known that the rise of greater centralization and state-formation over the long run of sociocultural evolution has been made possible by the ability of complex societies to capture free energy. Hierarchies and greater complexity are expensive in energy terms. Reductions in the availability of free energy have often been associated with the collapse of hierarchies and of complex divisions of labor (Tainter 1988). The coming peaks of resource production probably also raise the probability of future resource wars, especially in the absence of a strong and legitimate hegemon or a legitimate global state (Heinberg 2004). The size difference between Britain and the U.S. noted above probably slants against a fast collapse. Even the economic challengers have a vested interested in the current U.S.-centered financial system and are unlikely to do intentionally do anything that will undermine it. They own too many U.S. bonds and they depend too much on the ability of buyers in the U.S. to purchase their products. And though U.S. military capability will undoubtedly decline as the ability of the U.S. economy to support it wanes, this could take a long time, just as it will take time for new economic centers to develop their military capabilities. The military and economic size factors do not preclude hegemonic decline, but they do slow it down and also put off the onset of strong hegemonic rivalries. Future environmental catastrophes are likely due to industrialization and population growth overshoots and overconsumption in the core. Perhaps global warming could be slowed down by reducing the production of greenhouse gases. With the election of Barack Obama the U.S. administration signaled strong support, but the challenges of global adoption and enforcement seem less likely to be met now. The pressure to use more coal as oil prices continue to rise is likely to overcome the all the good intentions and international treaties. Environmental catastrophe will destabilize both the economy and existing political arrangements. Fragile states will be challenged by internal resource wars (such as the “blood diamond” wars in Africa) and whole countries will be increasingly tempted to use armed force to protect or gain access to natural resources. The collapse of fisheries, the arrival of peak water, deforestation, and pollution of the streams, ground water and seas and increasing global temperature and sea level will add to economic problems and exacerbate population pressures. The environmental dimension of the current situation could conceivably make a positive contribution to global governance if the response encourages the formation of international institutions that can organize a cooperative approach to solving the problems. But they could also make such a solution less likely by increasing competition over increasingly scarce natural resources. In the collapse scenario competition and conflict overwhelm cooperation and institution-building. Deglobalization will mean less international trade, less international investment and the reemergence of greater local and national self-reliance for the production of goods and services. The rise of transportation costs because of rising energy prices is one factor that should reduce international trade. Efforts to reduce carbon emissions will also involve greater regulation of long distance transportation by air, ship and truck and this will encourage a return to more local and regional circuits of production and consumption. International investment will decline if there is greater international conflict because the risks associated with investments in distant locations will increase. Greater local self-reliance will be good for manufacturing and for farmers in places where imports have been driving locals out of business. But the cost of many goods will go up. Services may continue to be supplied internationally if the global communications grid is maintained. It is expensive to maintain the satellites and cables, but this may be a good investment because long-distance communication can increasingly substitute for long-distance transportation. International business and political meetings can be held in cyberspace rather than by flying people from continent to continent. The carbon footprint of transoceanic communication is considerably smaller than the carbon footprint of transportation because information is lighter than people and goods. But the infrastructure of global communication also relies on international cooperation, and so the rise of conflict might make communications less reliable or the big grid might even come down (Kuecker 2007). A Global Democratic and Sustainable Commonwealth? Eventually the human species will probably escape from the spiral of population pressure and ecological degradation that has driven human socio-cultural evolution since the Stone Age. If the demographic transition continues its march through the Global South this is likely to occur by the year 2100 or so. After the total human population ceases to rise it will still take time to become adjusted to the economic, environmental and political problems that will result from a global population of 8, 10 or 12 million people. And even then history will not end because human institutional structures will continue to evolve and to generate new challenges. But the focus of this paper is the next several decades. The problem raised by the analysis above is that the existing institutions of global governance are in crisis and a new structure that is both legitimate and capable needs to emerge to enable the humans to deal with the problems that we have created for ourselves. But what could speed global state formation up such that an effective and democratic global government could be formed by the middle of the 21st century? First recall that in our understanding of the evolution of global governance world state formation has been occurring since the end of the Napoleonic Wars in 1815. The Concert of Europe was a multilateral international organization with explicit political intent – the prevention of future revolutions of the type that emerged in France in 1789 and the prevention of future Napoleonic projects. The Concert of Europe was fragile and eventually foundered on the differences between the rigid conservatism of the Austro-Hungarian Empire led by Prince Metternich, and the somewhat more enlightened conservatism of the British, led by Lord Castlereigh. But the emergence of a proto-world state was tried again in the guise of the League of Nations and once again as the United Nations Organization. We can notice that the big efforts have followed world wars. And we should also mention that the United Nations is a very long way from being a true world state in the Weberian sense of a monopoly of legitimate violence. All the previous advances in global state formation have taken place after a hegemon has declined and challengers have been defeated in a world war among hegemonic rivals. In Warren Wagar’s (1999) future scenario a global socialist state is able to emerge only after a huge war among core states in which two thirds of the world’s population are killed. A similar scenario is also suggested by Heikki Patomäki (2008). The idea here is that major organizational changes emerge after huge catastrophes when the existing global governance institutions are in disarray and need to be rebuilt. But using a global war as a deus ex machina in a science fiction novel is quite different from planning and implementing a real strategy that relies on a huge disaster in order to bring about change – “disaster socialism,” to borrow a phrase suggested by Naomi Klein’s (2007) discussion of how neoliberal globalizers have been able to make hay out of tragedies. Obviously political actors who seek to promote the emergence of an effective and democratic global state must also do all that they can to try to prevent another war among the great powers. Humanistic morality must trump the possibility of strategic advantage. This said, it is very likely that major calamities will occur in the coming decades regardless of the efforts of far-sighted citizens and social movements. That is why we have imagined the collapse scenario above. And it would make both tactical and strategic sense to have plans for how to move forward if indeed a perfect storm of calamities were to come about. But we should also try to imagine how an effective and democratic global government might emerge in the absence of a huge calamity. Instead we will suppose that a series of moderate-sized ecological, economic and political calamities that are somewhat spaced out in time can suffice to provide sufficient disruption of the existing world order and motivation for its reconstruction along more cooperative, effective and democratic lines. The scenario we have in mind involves a network of alliances among progressive social movements and political regimes of countries in the Global South along with some allies in the Global North. We are especially sanguine about the possibility of relatively powerful semiperipheral states coming to be controlled by democratic socialist regimes that can provide resources to progressive global parties and movements. The long-term pattern of semiperipheral development that has operated in the socio-cultural evolution of world-systems at least since the rise of paramount chiefdoms suggests that the “advantages of backwardness” may again play an important role in the coming world revolution. Our scenario would involve a coalescent party-network of the New Global Left that would emerge from the existing “movement of movements” participating in the World Social Forum (WSF) process. The first WSF was mainly organized by the Brazilian labor and landless peasant movements. The global meetings have been held in the Global South (Brazil, India, Kenya and Senegal). The long evolution of the modern world-system has been marked by waves of increasing democracy and global state formation brought about by a series of world revolutions and efforts by pragmatic conservatives to construct hegemony based on both coercion and consent. The form that will best suited for the future is a global democratic and collectively rational commonwealth. The main source of this sweeping change is already emerging in the contemporary semiperiphery and the periphery. The most powerful challenges to capitalism in the 20th century came from semiperipheral Russia and China, and the strongest supporters of the contemporary global justice movement are semiperipheral countries such as Brazil, Mexico and Venezuela and South Africa. Popular social movements have become increasingly transnational and information technology makes it much easier to organize global party networks than when Lenin tried to use a radio transmitter to call activists to the meeting of the first Comintern. And different forms of capitalism are challenging the neoliberal form championed by Britain and the United States. Semiperipheral societies are not constrained to the same degree as older core societies. They are freer to devise and implement new institutions. China’s “market society” is a different form of capitalism. Giovanni Arrighi (2006) contended that the Chinese form may be more capable of dealing effectively with the challenges of “globalization from below” than the neoliberal form has been. The historically transformative role of the semiperiphery has been strong in the past and is likely to be strong in the future. Hegemonic Transitions. Minneapolis: University ofMinnesota Press. "The U.S. Trajectory: A Quantitative Reflection, Sociological Perspectives 48,2: 233-254. Gesa Bluhm, Han Helmig, Andreas Leutzsch, Jochen Walter (eds.) Transnational Political Spaces. Presented at the Annual Meetings of the American Sociological Association. Brenner, Robert 2002 The Boom and the Bubble: The U.S. in the World Economy. London: Verso. Carroll, William K. 2010 The Making of a Transnational Capitalist Class. London: Zed Press. Past. Boulder, CO.: Paradigm Press. empires” Paper presented at the annual meeting of the American Sociological Association, New York. (eds.) The Future of Global Conflict. London: Sage. Hugill, Peter J. 1999 Global Communications since 1844: Geopolitics and Technology. Baltimore: Johns Hopkins University Press. Johnson, Chalmers A. 2006. Nemesis : the last days of the American Republic. New York: Metropolitan Books. Kennedy, Paul 1987 The Rise and Fall of the Great Powers, New York: Vintage Books. Worth, Globalization and the Semiperiphery: New York:Palgrave MacMillan. McCormick, Thomas J. 1989 America’s Half Century: United States Foreign Policy in the Cold War. Mann, Michael. 2002. Incoherent Empire. New York, NY: Verso. Are They Connected? Presented at the annual meeting of the American Sociological Association, Montreal, August 11. Global Politics and Economics. Columbia, SC: University of South Carolina Press. Modelski, George. 2005. “Long-Term Trends in Global Politics.” Journal of World-Systems Research. 11(2): 195-206. Patomaki, Heikki 2008 The Political Economy of Global Security. New York: Routledge. 1990. Lexington: University of Kentucky Press. Theoretical Directions for the 21st Century World-System New York: Greenwood Press. presented at the annual spring Political Economy of World-Systems conference, University of California, Riverside, May 3-4. _______________ 2008. Latin American and Global Capitalism: A Critical Globalization Perspective. States, 1816-1985" International Interactions, 14: 115-32. Sklair, Leslie 2001 The Transnational Capitalist Class. Malden, MA: Blackwell.
. Chaos and Governance in the Modern World System. Minneapolis: University of Minnesota Press, 151-216. University of San Francisco, August 7. Tainter, Joseph A. 1988. The Collapse of Complex Societies. Cambridge: Cambridge University Press. International Studies in Sociology and Social Anthropology, Vol. 37. Leiden: E.J. Brill. Peter Hugill’s (1999) study of global communications shows that Britain continued to lead in telegraph, radio and radar technologies that were important factors in the world wars of the twentieth century. This may be construed as progress.